Hailing from Mauritius, the small island nation off the Southeast coast of Africa that bares the linguistic legacies of both Dutch and French colonisation, Umar Timol writes poetry in a French creole that is thick with neologisms. Belgian author Hilde Keteleer described him as “a poet who aspires to take every form and style – in fact every genre – and appropriate them for himself”. Returning guest-translator Delaina Haslam will be introducing Timol’s work and providing the bridge translation for this session. 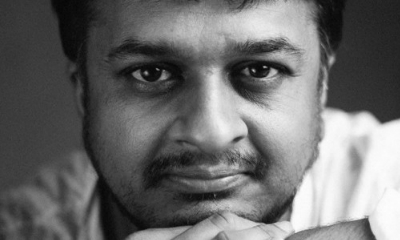 Umar Timol is a Mauritian poet and writer. He has three poetry collections to his name and two novels. He has also published a collection of aphorisms, and writes comic book scripts. He has received two Centre National du Livre grants, and taken part in festivals around the world, including the Medellin International Poetry Festival in Colombia and the Poetry International Festival Rotterdam. In 2018 he will take part in the Iowa International Writing Programme. Delaina Haslam is a translator, editor, and writer. She translates from French and Spanish, specialising in sociological and literary texts. She worked in journalism and publishing in Madrid and London before studying translation. She has written for and edited publications including In Madrid magazine and le cool London. She’s interested in collaborative translation and has had a submission accepted for Newcastle University’s Poettrios Experiment.